Eculizumab makes a guest appearance in India! Recently, doctors at Medanta Hospital, Gurgaon, including Medical Advisor to The Atypical HUS India Foundation, Dr. Sidharth Sethi were faced with a 12 year old boy that had the classic signs of Atypical HUS - hemolytic anemia, thrombocytopenia and uremia. Other conditions were ruled out and aggressive Plasmapheresis initiated. The boy stabilised and was discharged. A complement factor assay was normal. The boy fortunately was an American citizen. Eculizumab was procured from Alexion Germany with co-ordination by the American Embassy. The cost of the drug was presumably covered by the boy's insurance company in the US. A complete genetic analysis was done in France which also did not identify any known genes implicated in aHUS. Subsequently, Eculizumab was withdrawn and the boy continues to do well. The entire sequence of events was recently published in the Indian Journal of Nephrology and an initial version can be found here. 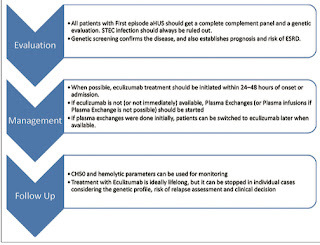 "... the high cost of the drug and the uncertainties surrounding the natural history of aHUS in patients for whom eculizumab prevented the progression to end‑stage renal disease, raise the question of whether life‑long treatment is warranted for all patients with aHUS. Given that the natural history of aHUS differs depending on the underlying genetic abnormalities, treatments could be tailored on the basis of an individual’s complement genetics. 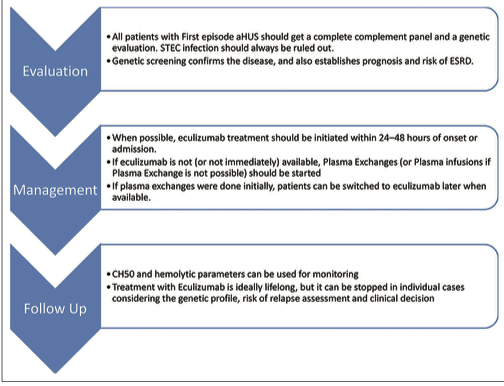 Life-long treatment may be appropriate in patients with aHUS who have mutations associated with poor outcomes (e.g. CFH or C3/CFB gain‑of‑function mutations). We also carefully planned to stop eculizumab in our patient, since he had no major genetic mutations, with a normal complement panel." "The nonavailability of the drug in India raises ethical concerns. HUS being a common cause of acute kidney injury in children in India should get timely and appropriate management with lifesaving eculizumab or PEs. To improve the availability of the drug in Indian market, and subsequently decrease the cost of drug, collaboration among medical experts and health authorities must occur in order to implement a feasible plan of action."